If you are looking to work out your legs without going to the gym or want Best Elliptical Trainer 2019 without compromising the room space then Stamina InMotion Elliptical Trainer should be your first choice. With this trainer, you can easily do workouts in your own home. You can get this machine for a very reasonable price. Now we are going to give you a total review of this elliptical machine so that you can understand whether this product is good for you or not. Stamina In-Motion Elliptical Trainer is trouble-free to get the convenient and versatile exercise you desire. 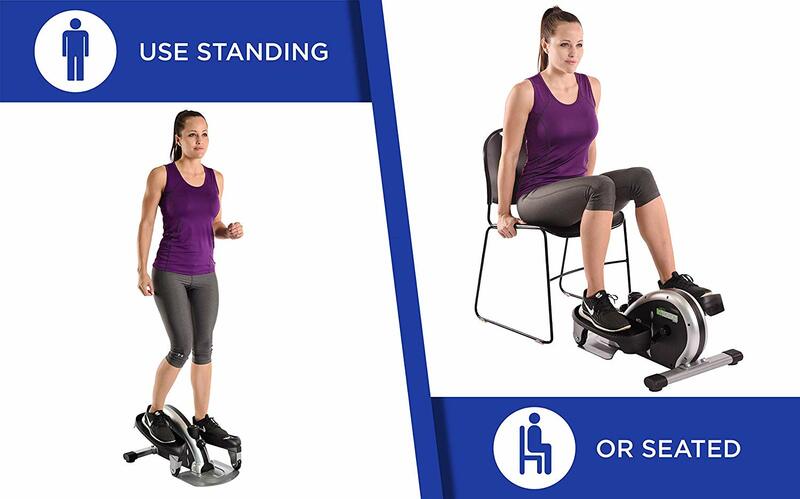 This Budget-friendly machine can be used easily while you are standing, sitting, or by pedaling in reverse-motion. Whether you’re watching television, working at the office or reading a book, you can easily carry this elliptical machine for exercise. These best elliptical trainer workouts burn the same number of calories like jogging. With the help of the multi-functional fitness monitor, you can track your improvement easily. This Fitness monitor of Stamina In-Motion Elliptical Trainer tracks workout time, total strides, strides per minute, and calories burned. Lightweight (24 pounds) and Compact elliptical trainer. Electronic monitor tracks strides, calories, and exercise time. You’ll engage your core in the standing position, which in turn will burn more calories. But when you are in the sitting position, you’ll solely target your lower parts of the body. You’ll be motivated to keep pedaling because the multi-functional monitor tracks your improvement. This Fitness monitor also has a scan function in order to see all the exercise stats of yours periodically. By adjusting the tension knob, this machine controls the intensity of your workout easily. You can do other things too because the resistance is very quiet. 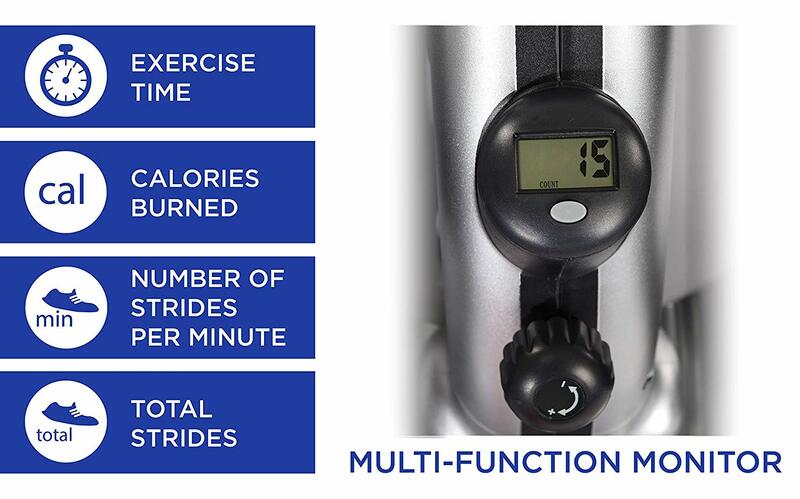 The Stamina InMotion Elliptical Trainer has an electronic motor that helps track and display the duration of your exercises. It also shows the number of calories you have burned. This electronic motor feature is just awesome! You can pedal as fast and hard as you want. 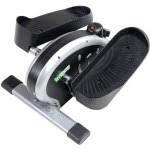 No matter how you use the elliptical trainer the textured surface of the pedals will make your feet safe and secure. You can easily do forward and reverse motion workouts with this elliptical machine. Sometimes it’s nice to change the forward and reverse motion. You can target different important muscles in your legs and glutes by varying the track of your pedaling. Batteries – 1 LR44 batteries required. This trainer can be shipped to select countries out of the U.S. Domestic Shipping – Amazon only ships this item within the contiguous 48 United States. Its small size doesn’t allow it to flow as smoothly as full-sized elliptical machines. Stamina InMotion Elliptical Trainer is a sturdily-made compact trainer that can be used easily while you are standing, sitting, or by reverse-motion pedaling. The fitness meter of this machine helps to track and display the duration of your workouts. It also shows the number of calories you have burned. Those who are looking for a way to exercise during certain tasks at a desk for a reasonable price then go for this Stamina InMotion Elliptical Trainer.